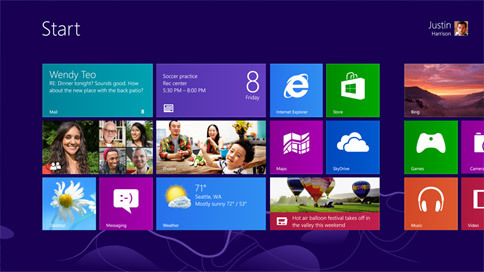 With the rollout of Windows 8, there are a number of people asking the same question: Where's the Start Menu? Rather than including the familiar start button that Windows users are accustomed to, Windows 8 has made ambitious changes to several different aspects of Windows, and it now features the Start Screen instead of the old Start Menu. While the Start screen has its advantages and plenty of proponents, some users will invariably prefer the familiarity and ease of the good old start button. For those who want to get the Window Start Menu back, you're in luck - and you have options. Below are a number of free and cheap downloads that will let you customize your Windows 8experience, including the Start Screen and Start Menu. Stardock's Start 8 software allows you to bypass the Windows 8 Start Screen completely and go straight to the desktop. Start8 has received great reviews from the likes of Forbes, and with a free trial, there's no risk in taking it for a spin. Developed by SweetLabs, Pokki for Windows 8 lets you access all files, folders, and programs from a nicely designed start menu. Pokki is free to download, and the developers are continuing to release new updates to the software. Along with the classic start menu, Classic Shell brings back several features from previous versions of Windows. This free download gives users the familiar shortcuts, search fields, Run command, and shut down and hibernate icons. There are basic and advanced versions available - depending on how much you are looking to customize your Windows experience. Another option for replacing the Start menu on Windows 8 is Power8. Power8 gives the usual start menu at the lower left on Windows 8, letting you access all programs, applications, and folders. By right-clicking on the menu icon, you are able to choose among a number of options that allow you to customize the software. These are just a few of the available downloads; users can also replace the Start Menu on Windows 8 with software such as StartMenu7, ViStart, StartW8, Win8 StartButton, and others. As more people continue to adopt the Windows 8 platform, there will certainly be more options popping up - and more ways to customize the interface. If you have Windows 8, what are your feelings about the new Start Screen? Do you prefer the Start Menu, and would you try one of these replacers?